By now you may have already started entering contacts into Realvolve and that is great if you have! I'm sure that you were able to figure out most of the process very easily. Today, we will be covering some of the finer details of entering contacts so that you know how it all comes together. I will also go over tips and tricks in keeping your contacts organized so you can find and process them easier. We call the left side of the screen the List View because it contains mostly lists of items. There are 7 icons which are the primary sections of the Realvolve system: Contacts, Properties, Transactions, Documents, Tags, Activities and the ( + ) Plus Sign for adding new data. Adding a contact is easy, simply click on the ( + ) sign in the list view, then click on Contact. Of course you will do the same thing when adding Properties, Transactions, Documents or Activities to the Calendar. This will take you to the Contact tab of a new contact record in the database. At the top of the screen click on "FIRST NAME" and enter the contact's first name, then do the same with "LAST NAME". TIP: Notice the small icon on the right of the last name: When you click on this icon, it will copy the "dropbox" email address to your clipboard. This is a special email address given to each contact, property and transaction so that emails can be automatically sorted to the record. In the Contact tab you can enter the Home, Work and Additional information like Address, Mobile Phone, Regular Phone, Fax, Email and Website. You simply click into the field and start typing. As you leave the field it is automatically saved and your information is secure. Click into the address field, the field will expand to allow entry into the individual address fields. When using this method, you should only need to enter the street address and zip code, the system will do the rest of the work for you by looking up the City, State, Zip, County and Country where possible. When you press the Save button in Address Details it puts the full address into the single address field for you. By Entering a Birth date into the system, Realvolve will automatically add it to the calendar for you. It is treated as a repeating activity so you will be reminded each year. Kids names can be entered one at a time and then press TAB or ENTER to enter the next name. When you enter a name and you have a connected relationship contact that has the kids names set to copy then both contacts will show the list of names. TIP: Record Type is either Person or Company. When selected as Person, the system will normally show the Home information when displaying this contact in a list or as a party member to a transaction. If it is set to Company, then the Work Address is displayed. The Active Contact status is used to prevent the contact from getting printed, exported or emailed when set to No. If you find that a contact is not being contacted you should check this setting and make sure the value is set to Yes. In the Source Details section you can keep track of referral information as well as details on where this contact came from. Knowing source type is important, by keeping track of which sources produced the best results, you will be sure not to waste precious marketing dollars. To link another contact to this contact as a referral connection, simply type the name of the contact and select them from the list. They are instantly connected for reporting later. The next section of the screen is the Details area. This allows you to keep track of the last time you made a call to this contact, made a personal visit or wrote a personal note. Many real estate trainers and speakers promote the importance of these three concepts. Later, we can use this information for scheduling regular monthly, quarterly or yearly connections. The last section, Connections is important for keeping up with your contact's social media feeds. The information in the feeds are displayed in the Radar tab of the contact and allows you to get quick information before calling your contact. I have contacts that do not include a first and last name for a business. How do I remove that portion of the contact so it does not show as "First Name", "Last Name"? How do I add a relationship between parents and children, i.e., clients who refer their grown children as clients. Would like to link parent-child relationships in Realvolve to show that they are connected. 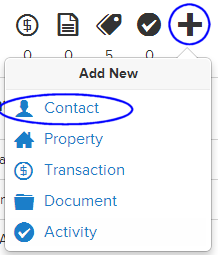 We will be adding a "People" Tab in the Contact record, similar to what is in the Property and Transaction screens. How do I delete a kid from the kids tab? If you hover over it, you will see an X to the right. If you don't, you may not have permission to delete for that contact. Thank you. I discovered the issue. I'm having trouble with Realvolve on my IPad Pro. I've asked why full names don't appear in the contact page for each contact; the last name gets cut off. In addition, as I've discovered the edge of the page is cut off. I couldn't see the "x" beside the box for kids name. I could on my laptop but not the iPad using the full browser site. Any ideas on how I change the size of the Realvole screen on my iPad so that it shows everything? Hi Chris - That's queued in our support list and we will update you there when it is fixed. The Support Ticket # is 6762. Thanks! The wedding anniversary date does not and cannot be put into the calendar, is that correct? HI Michael - The Anniversary is not added to your calendar automatically, no. Only the birthday is added automatically. To add to your calendar you would create a repeating activity. Hi, I am using the trial right now and I'm looking for the People tab you mentioned above on this thread. I can't find it. Can you help? Hi Lilly, We have not added the Tab yet. That's why you don;t see it. We'll get there. It just hasn't been a top priority yet. Hi. I am having difficulties trying to keep track on how many people including their names viewed a certain property. I do enter the sellers details with their property and enter the viewers details separately . But i am unable to see all in one go if a owner asked how many people have viewed my property and dates. without remembering each viewers name ? can you help me out here?? Hi again, I havent had a response from my last message 27 October 2018. I was wondering if anyone can help me. once I Have input clients name who viewed owners properties how can I pull up in one go how many viewings this property had including dates ?? I'm looking for a best practices tutorial on using Contact Type, Stage, Contact Status in conjunction with tags.